It’s actually pretty shocking to me that on Saturday, I wrote this bleak, helpless post. Then by Saturday evening I was feeling better. On Sunday morning I went one of the first area launch meetings of the new Weight Watchers PointsPlus Program (try saying THAT ten times fast) which was like a HUGE PARTY and by Sunday afternoon I felt ready to put my sneakers on and try and run ten miles. It shocked me. It really did. I’ve been struggling with running in one way or another ever since I did my first 5k back in 2009. I often end up getting dehydrated and sick, or hurt in my ankles or feet. So I was feeling trepidatious. But I really felt like I need to get this 10 miler down to see if I could really manage the half marathon in Las Vegas next weekend. And I learned some stuff! Some really important stuff!! I need to start out slooooooooooow. This is the complete antithesis to what usually happens during a race. There is so much adrenaline, and people are bouncing up and down, and the gun or the bullhorn goes off, and it’s like… WHOOOOSH! Everyone takes off. I always have started out every race way, way, way too fast. Like crazy fast. And what happens? I end up feeling really bad very quickly. On Sunday, I decided to start slowly, ie walking. Walking briskly, but WALKING. And I told myself I would not run until I felt like running. Which did not happen for a good half mile. Now during a REAL RACE, this means a lot of people – I mean HUNDREDS of people – will be passing me by. And I have to just not let that get to me. I have come to realize that I am really a loner when it comes to running. 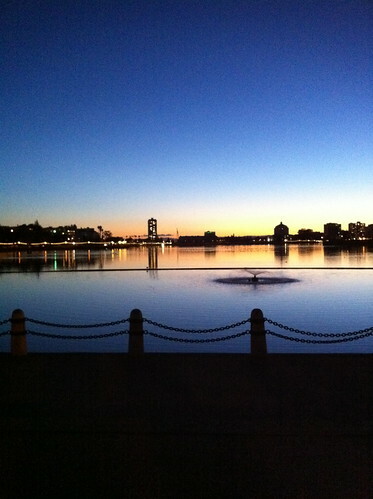 When people want to run with me, it generally makes me kind of nervous because I lose my natural pace. So I am going to have to really hunker down into mySELF during the Las Vegas half because that is what is going to get my through. I need to be well hydrated but not TOO hydrated. Duh. I have been dehydrated so much it’s embarrassing. But I finally realized that what I need is a sports drink, like sugar-free Gatorade or Powerade or some such, and those little Gu chomps. (ie giant gummy bear things) And just a little bit of water. That’s my combo. That’s what I used on Sunday, and it worked better than any other long run I’ve had. Slow, slow, slow. I just told myself that I would lope along at my turtle pace and stay comfortable at all times. I never got short of breath or otherwise strained. I just wanted to be comfortable. This is a good thing. My feet and ankles had a few Moments of discomfort, but weirdly enough, the 10 mile run around the lake felt 100x better than a ten MINUTE run on the treadmill. Go figure. So. So that’s it. That run on Sunday was just… amazing. It was as good or better than the 9 mile run I did a while back. It amazed me. And when my Runkeeper app hit that 10.01 mark, I just about cried. I could have gone on. I wasn’t wiped out. I knew then that I would be able to finish the half, and that I could probably stay within spitting distance of my 15-minute mile pace. Which is glacially slow for some people, but just right for me. 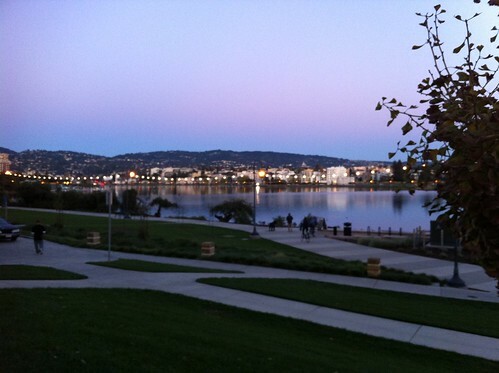 I was so in love with Oakland when I ran this run. I started out in the late afternoon and by the time I finished (2.5 hours later) it was dark. The necklace of lights turned on around the lake, and I saw the runners, the hobblers, people of every race and age and size and ability, all circling around. It was a beautiful thing. Wow, you go! I sound like a broken record but how inspiring to read this. Once my psoas muscle thing settles down, I really want to start running finally. And the pictures are gorgeous! Can’t wait for tomorrow’s meeting…excited for the new start. Wow! Amazing pictures! Makes me wish I had these views on my runs! Great shots! You know, my whole life I wanted to be a runner, and always said I can’t, I can’t. . . until I started blogging about trying C25K and everybody and their brother said START SLOW. And it made ALL THE DIFFERENCE! I mean, I’m still not a runner. I don’t really like it. And I’m not running on Sunday probably at all. I really only love running when I’m doing intervals. But that slow advice? BEST EVER. So who cares who passes you by? Right? You’re gonna do SO GREAT on Sunday! Woo hoo! There is nothing more powerful than “putting it out there”…and in doing so you opened yourself up for a powerful run! Kick it Foodie! What an awesome run! You will rock Vegas. I also read on Hal Higdon’s site where he advises beginning runners to run really slowly. Yay Foodie! Wow, 10 miles! And what a beautiful route too. Good luck with the half! Beautiful views! Proud of you!